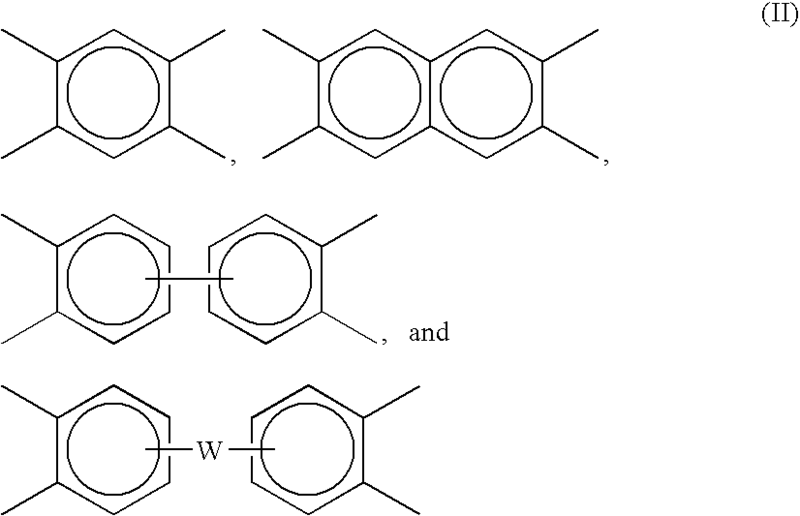 wherein W is a divalent moiety such as —O—, —S—, —C(O)—, —SO2—, —SO—, —CyH2y (y being an integer of 1 to 20), and halogenated derivatives thereof, including perfluoroalkylene groups, or a group of the formula —O-Z-O— wherein the divalent bonds of the —O— or the —O-Z-O— group are in the 3,3′, 3,4′, 4,3′, or the 4,4′ positions, and wherein Z includes, but is not limited to, divalent moieties of formula (III). After the consumption of equal to or greater than 50 weight percent (wt-%) of the initial charge of the monomers it can be useful in some embodiments to isolate the precipitated polymer. In other embodiments the precipitated polymer may be isolated when equal to or greater than 90 wt % of the initial charge of monomers are consumed. This can be done using a variety of methods, for example, filtration, centrifugation, floatation, freeze-drying, and combinations comprising one or more of the foregoing methods. In some embodiments equal to or greater than 95 wt % of the isolated precipitated polyetherimide, based on the total weight of the isolated precipitated polyetherimide, passes through a 2 millimeter (mm) mesh screen. In some embodiments the isolated precipitated polyetherimide is a free flowing powder with an average particle size of 10 to 5000 micrometers. Examples 1-3 (which are based on pre-polymers) when compared to Comparative Example 4 (which is not based on a pre-polymer) show the unexpected behavior of polyetherimide blends when a pre-polymer was used to make the blends. Blends of PEI 1 and PEI 3 exhibited two phase morphology and delamination even at low levels of PEI 3 (15 weight %). In contrast, despite the two phase resin morphology, blends of pre-polymer and PEI 3, even at 40 weight %, did not not show delamination after heat aging at 280° C. for 240 hours. Surprisingly, melt mixing with a reactive pre-polymer overcame the problem of delamination in an immiscible, incompatible blend and resulted in an immiscible, but compatible blend of practical importance. 2. The method of claim 1, wherein the dianhydride is oxydiphthalic anhydride and the diamine is a diamino diaryl sulfone. 3. The method of claim 1, wherein the polymer is selected from the group consisting of polyimides, polyetherimides, polyamideimides, polyaryl ether ketones, polyaryl ketones, polyether ketones, polyether ether ketones, polyaryl sulfones, liquid crystal polymers, polyamides, polyesters, polysulfones, polyphenylene sulfides, polybenzimidazoles, polyphenylenes, and combinations of two or more of the foregoing. 4. The method of claim 1, wherein the pre-polymer is present in an amount of 1 weight percent to 99 weight percent, based on the combined weight of the pre-polymer and the polymer and the polymer is present in an amount of 1 weight percent to 99 weight percent, based on the combined weight of the pre-polymer and the polymer. 5. The method of claim 4, wherein the pre-polymer is present in an amount of 10 weight percent to 90 weight percent, based on the combined weight of the pre-polymer and the polymer and the polymer is present in an amount of 10 weight percent to 90 weight percent, based on the combined weight of the pre-polymer and the polymer. 6. The method of claim 5, wherein the pre-polymer is present in an amount of 20 weight percent to 80 weight percent, based on the combined weight of the pre-polymer and the polymer and the polymer is present in an amount of 20 weight percent to 80 weight percent, based on the combined weight of the pre-polymer and the polymer. 7. The method of claim 1, wherein the pre-polymer has a ratio of carbon atoms/(nitrogen atoms+oxygen atoms+sulfur atoms) of 2.8 to 4.2. 9. The method of claim 8, wherein the first dianhydride or the second anhydride is selected from the group consisting of oxydiphthalic anhydrides, bisphenol-A dianhydrides, and combinations thereof. 10. The method of claim 8, wherein the first diamine or the second diamine is selected from the group consisting of diamino diaryl sulfones, metaphenylene diamines, paraphenylene diamines, and combinations thereof. 11. The method of claim 8, wherein the pre-polymer is present in an amount of 1 weight percent to 99 weight percent, based on the combined weight of the pre-polymer and the polymer and the polymer is present in an amount of 1 weight percent to 99 weight percent, based on the combined weight of the pre-polymer and the polymer. 12. The method of claim 8, wherein the pre-polymer is present in an amount of 10 weight percent to 90 weight percent, based on the combined weight of the pre-polymer and the polymer and the polymer is present in an amount of 10 weight percent to 90 weight percent, based on the combined weight of the pre-polymer and the polymer. 13. The method of claim 8, wherein the pre-polymer is present in an amount of 20 weight percent to 80 weight percent, based on the combined weight of the pre-polymer and the polymer and the polymer is present in an amount of 20 weight percent to 80 weight percent, based on the combined weight of the pre-polymer and the polymer. 14. 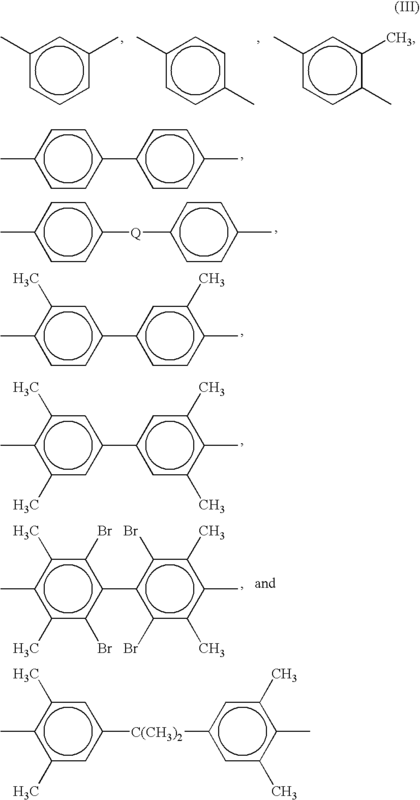 The method of claim 8, wherein the pre-polymer comprises structural units derived from oxydiphthalic anhydrides and diamino diaryl sulfones and the polymer comprises structural units derived from bisphenol-A dianhydrides and diamino diaryl sulfones. 15. The composition of claim 8, wherein the pre-polymer has a ratio of carbon atoms/(nitrogen atoms+oxygen atoms+sulfur atoms) of 2.8 to 4.2. 17. The method of claim 16, wherein the first dianhydride or the second anhydride is selected from the group consisting of oxydiphthalic anhydrides, bisphenol-A dianhydrides, and combinations thereof. 18. The method of claim 16, wherein the first diamine or the second diamine is selected from the group consisting of diamino diaryl sulfones, metaphenylene diamines, paraphenylene diamines, and combinations thereof. 19. The method of claim 16, wherein the pre-polymer is present in an amount of 1 weight percent to 99 weight percent, based on the combined weight of the pre-polymer and the polymer and the polymer is present in an amount of 1 weight percent to 99 weight percent, based on the combined weight of the pre-polymer and the polymer. 20. The method of claim 16, wherein the pre-polymer is present in an amount of 10 weight percent to 90 weight percent, based on the combined weight of the pre-polymer and the polymer and the polymer is present in an amount of 10 weight percent to 90 weight percent, based on the combined weight of the pre-polymer and the polymer. 21. The method of claim 16, wherein the pre-polymer is present in an amount of 20 weight percent to 80 weight percent, based on the combined weight of the pre-polymer and the polymer and the polymer is present in an amount of 20 weight percent to 80 weight percent, based on the combined weight of the pre-polymer and the polymer. 22. The method of claim 16, wherein the pre-polymer has a ratio of carbon atoms/(nitrogen atoms+oxygen atoms+sulfur atoms) of 2.8 to 4.2. 24. The method of claim 23, wherein the pre-polymer has a ratio of carbon atoms/(nitrogen atoms+oxygen atoms+sulfur atoms) of 2.8 to 4.2. 26. The method of claim 25, wherein the pre-polymer has a ratio of carbon atoms/(nitrogen atoms+oxygen atoms+sulfur atoms) of 2.8 to 4.2.
melt mixing the polymer blend with an additional component. 28. The method of claim 27, wherein the additional component comprises a second polymer. 29. The method of claim 27, wherein the second polymer is selected from the group consisting of polyphenylene sulfone, polyetherimide, polysulfone, polycarbonate, polyphenylene ether, poly methyl methacrylate, acrylonitrile butadiene styrene, polystyrene, polyvinylchloride, perfluoroalkoxyalkane polymer, co-polymer of tetra fluoro ethylene and perfluorinated vinyl ether, fluorinated ethylene propylene polymer, poly(phenylene sulfide, poly(ether ketone), poly(ether-ether ketone), ethylene chloro trifluoro ethylene polymer, polyvinylidene fluoride, polytetrafluoroethylene, polyethylene terephthalate, polyacetal, polyamide, ultra high molecular weight polyethylene, polypropylene, polyethylene, high density polyethylene, low density polyethylene, polybenzimidizole, poly(amide-imide), poly(ether sulfone), poly(aryl sulfone), polyphenylenes, polybenzoxazoles, polybenzthiazoles and blends and co-polymers thereof. 30. The method of claim 27, wherein the additional component comprises a filler, reinforcement, additive or combination thereof. 31. The method of claim 27, wherein the pre-polymer has a ratio of carbon atoms/(nitrogen atoms+oxygen atoms+sulfur atoms) of 2.8 to 4.2.